Selamat Pulang or welcome home to all the Malaysian chess contingent of 30 players and 15 accompanying adults from Tarakan Island, Indonesia after participating in the recently concluded 12th Asean+ Age Group Chess Championship. Malaysia won 4 Golds, 6 Silvers and 4 Bronzes. 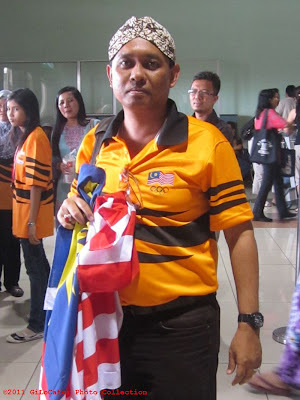 Puteri Munajjah or popularly known as Eja (above photo), one of the U10 dream team members, had won four gold medals - two in Individual and another two in Team. She is the champion for both Girls 10 Blitz and Rapid. Beside Eja, Nur Nabila is another winner in the blitz competition. She won the silver medal in the Girls U14. 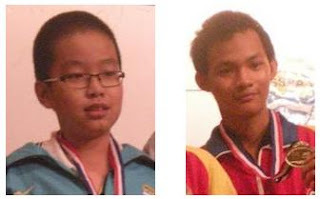 Teh De Juan, Teh De Zen and Tan Li Ting make Malaysia proud in the standard format. All of them are the silver medalists. To GiLoCatur's knowledge, De Juan will be awarded CM or Candidate Master while both De Zen and Li Ting will be awarded WCM or Women Candidate Master for being the first runner ups. SYABAS and TAHNIAH to Eja and all the medalists among the Malaysian chess contingent. Keep learning and practicing to become chess masters and champions. See you in Vietnam next year. Bisa kamu namakan pemain catur di atas? Six rounds of the standard competition had completed. The Malaysian players scored 9 wins and 6 draws. Not a good results since only half of them managed to score points. Whatever it is the championship is not over yet. The standard tourney is entering the critical final stage. Our juniors need to stay fighting until the end. Our best hope is in Under 10 section. In the boys category, even though De Juan lose his sixth round, he is still on top sharing 5/6 points with two Indonesian players - Ivan Maxmillian Putra and Catur Adi Sagita (what a name). Hope he wins tomorrow morning to cruise through the final round and emerge champion. Playing in the Girls U10 category, De Zen (above picture) is the best performer among the Malaysian contingent so far. She won her two games today. With 5.5/6 points she is the current leader followed behind half point by a Mongolian player and compatriot, Puteri Munajjah by one point in the third place. From GiLoCatur's calculation based on the chess-results.com, Malaysia has a very good chance to claim gold for the team medal in this category. The Malaysian G10 team is leading Vietnam by one full point. Best of Luck to all the Malaysian players. DO NOT STOP FIGHTING! Blitz tournament was held on the third day afternoon. GiLoCatur is not so sure about the format. Nine rounds were played yesterday afternoon. Based on the schedule, there would be semi finals and finals rounds this morning. In this entry, GiLoCatur will highlight about the nine-round blitz tourney. All the thirty Malaysian players took part. GiLoCatur noticed that several participants did not take part like few Korean players. Maybe they do not want to spoil their standard games. So, how were the performance of the Malaysian players? Which country emerged top rank in each category? Both Puteri Munajjah AzZahraa or simply known as Eja and Nur Nabila became the saviors for the Malaysian chess contingent in the blitz tournament. 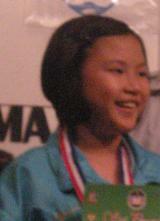 10-year-old Eja (below picture) won her first six rounds before she drew with a Vietnamese player in the 7th round. Then she won against a Mongolian opponent in the 8th round playing black. Even though she was defeated in the last round, she emerged top with 7.5/9 points, one point clear than the first runner up. Eja is also at the driving seat in the standard category. After the fourth round, she is leading with 3.5/4 points. With good performance until the end from both De Zen and Nur Islamurni who are currently second and third respectively, Eja may get gold medal in both individual and team categories. Nabila played in the Girls 14 category in the blitz tournament instead of the Girls 20 she participates for the standard tournament. She was ranked first before the start of the blitz tournament. The 14-year-old student of SMK Saujana secured 6 wins, one draw in the final round and 2 defeats. With 6.5/9 points, Nabila was placed second behind Mira Mirano of Philippines whom she defeated in the 8th round. SYABAS and TAHNIAH to both Eja and Nabila. Keep up the winning momentum in both the standard and rapid tournaments. To the other Malaysian players including GiLoCatur's daughter, Anis Fariha, do not stop fighting. Play your best games! Do not afraid to play your opponents. GiLoCatur was very anxious to know the results of the third round especially of Anis. The text message from her has not been received. GiLoCatur's text message also not replied. Most probably, her mobile battery is out and can not be recharged. At around 9 o'clock, GiLoCatur texted Nabila's mother. She replied her daughter, Nabila, lose. GiLoCatur became more anxious. GiLoCatur keeps refreshing the chess-results.com. Finally, at around 9.30pm the results were updated. Quickly, the results of G14 category was checked. What a relief. Anis won. So, what are the latest results? 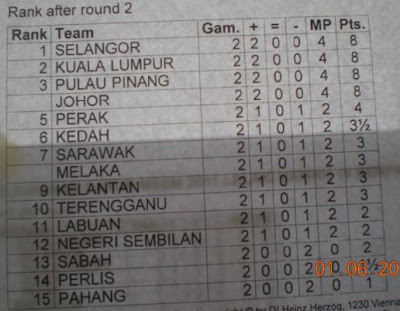 After three rounds had completed, only two Malaysian players left with the perfect 3/3 points. Who they are? In the Open 10 category, De Juan (left picture) from Penang who won bronze in L12 Individual in the recent MSSM will play white against the top seed, Rajalyan Kuvelkar from India. Meanwhile, Faizal Roslan (right picture) has the toughest opponent to beat in the fourth round tomorrow morning. His opponent is the second seed, Vietnamese CM Le Huu Thai whose ratings is about 200 higher. GiLoCatur hopes Faizal will play his best game to defeat his opponent. In B08 category, only one player won. The other three players lose whom two of them had 2/3 points. In B12 category, two drew while the other two were defeated by their respective opponents. In B14 category, two Malaysian players won including Faizal while their other two countrymen could not win. In B20 category, Malaysian sole representative LZR won his first point. In G08 category, just half point could be scored out of two points from one draw. All the four Malaysian players in G10 category drew their third round matches including an all Malaysian match up between Puteri Munajjah and De Zen. Malaysia has five players in G12 category. Three of them drew, one won while the other lose. A win and two draws is scored in the G14 category. Both Malaysian players in G16 and G20 categories lose to their respective opponents. So what's the statistics of the Malaysian players in the third round? 5 wins, 2 draws and 7 defeats for the Malaysian boys. Just 2 wins, 9 draws and 5 defeats for the Malaysian girls. Three rounds or one third of the standard competition has completed. GiLoCatur advice to all the 30 Malaysian players, JANGAN TAKUT LAWAN! It is now past 3 o'clock of Tuesday, 14th June 2011. The third round of the 12th Asean+ Age Group Chess Championship will start in less than one hour. So, what is the update? Let's check it out. For the Malaysian team in boys sections, Under 8 and Under 14 have a good start. Two players have perfect 2 points score. The Malaysian boys teams score 5/6 and 4.5/6 points respectively for 3-player team medals. The Malaysian sole representative in Boys U10 also have a good start after winning both his rounds. Unfortunately, he will not get the team medal because need two team mates to make a team. among the leading pack. Unfortunately, in both categories they have to face each other. The Malaysian third player needs to win the third rounds this afternoon to help Malaysia win the team medals. Statistically, the Malaysian boys have scored 9 wins, 4 defeats and 1 draw. While the girls have scored 7 wins, 4 draws and 5 defeats. Nine players thus far win the first two rounds. Keep it up. To the four players who have yet win a game, DO NOT GIVE UP! PUT YOUR BEST FIGHTS UNTIL THE LAST ROUND. YOU CAN WIN FOR SURE! GiLoCatur hopes the Malaysian contingent will have the most wins in the third round. YAKIN BOLEH, BISA MENANG! SELAMAT BERJUANG KEPADA SEMUA PEMAIN-PEMAIN CATUR MALAYSIA! 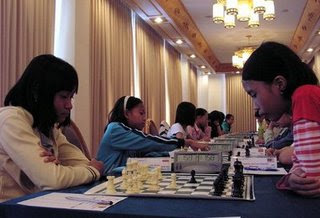 The first round of the Asean+ Age Group Chess Championship currently being held in Tarakan Island, Indonesia had completed yesterday (Monday, 13/06/2011) morning. The second round supposed to be played in the afternoon at 4 o'clock is postponed to the second day. So, how's the results? For the Malaysian boys, the results is 6 wins, 7 defeats and 1 draw. While it is 9 wins, 5 defeats and 2 draws for the Malaysian girl players. So, statistically half of the team won in the first round. Hopefully, there would be more wins in the second round. At least two thirds. MALAYSIA BOLEH! Click here to view the full results of all the Malaysian players. [ The result is a draw. A commendable result in GiLoCatur's opinion. So, who is Nabila's next opponent? An Indonesian player named Chkartina Gerhana who has FIDE ratings of 2082. A tough opponent for Nabila GiLoCatur believes because Chkartina won the Highest Placed Female and Best FIDE Performance U2200 in last year Hastings Masters. She also earned her WIM norm in the tournament. Below are her two games in the tournament. The rivalry between Nabila and Medina from Indonesia who both play in the Girls U20 category will start immediately in the first round in the 12th Asean+ Age Group Chess Championship. Two years ago in Vietnam, Medina emerged champion in the 10th edition. During then they played in the Girls U12 category. Medina defeated Nabila in the sixth round playing white. 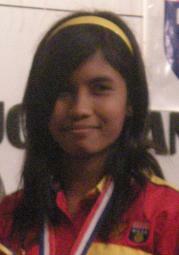 Last year in Subic Philipppines, Nabila did not take part while Medina began to play in the Girls U20 division. Below is their game two years ago. Surely, their games mature and improve further. GiLoCatur hopes both of them will become the chess icons in future and the proud chess players of their respective countries and the South East Asia region. So, who will win? Let's wait for their match to complete. Their battle just began. Go to http://anisfarihasaleh.blogspot.com if you follow the Girls U14 category. The Malaysian chess contingent of 30 players including GiLoCatur's daughter, Anis Fariha, and 14 accompanying adults had took off to Tarakan Island, Indonesia this morning. The players will take part in 11 different categories and three types of tournament - standard, rapid and blitz. NM Lim Zhou Ren or simply LZR, the reigning national men champion, is leading the Malaysian players. He will participate in the Open Under 20 category. Meanwhile, the reigning national women champion, WNM Nur Nabila who emerged P15 (Under 15 Girls) Individual champion in the recently concluded MSSM Chess Competition will lead the Malaysian girls. She will play in the Girls Under 20 category. All the best to every Malaysian player! Make Malaysia and your parents proud! At the writing time, the Malaysian delegation had just landed in Balik Papan before embarking the flight to Tarakan at around 8.00pm. MSSM Chess Championship for 2011 edition is over yesterday. The winners were happy to be on the podium receiving their medals and prizes. The chess athletes had been fought very hard over the chess boards. The champions were surely excited and joyful. Let's see the performance based on the medal distribution. In 2010, Pulau Pinang won the most gold medals when winning all the team events for B12 and B15 both boys and girls. While Selangor dominated the Individual category by winning three out of the total 6. Wilayah Persekutuan just managed one gold medal from the L15 Individual category. However, the three chess dominating states were not the champions in the B18 sections both boys and girls. Sabah, Perak, Melaka and Johor each won a category in the B18 division. In 2011, Wilayah Persekutuan became top in winning the most gold medals when it managed to win four gold medals, all in the team events. The state's strategy is to put all the best players in the team event sacrificing the individual event. Thus, WP gained three more gold medals compared to only one in previous year. Pulau Pinang dropped one gold medal from 4 last year to just 3 this year. It won one in the Individual category and two in the team category. Selangor just maintained the number of gold medals which is three, all in the Individual section. The state missed the best chance of winning a gold medal in the L15 team category. Had the team draw with its last round opponent, Selangor would have four gold medals instead of Wilayah Persekutuan. Melaka maintained its one gold medal tally after Alia defended her title in the P18 Individual category. Kedah performed better than last year based on the medal distribution. This year, it managed to win one gold, one silver and one bronze. Last year it won only a bronze medal. This year the Fuad siblings - both Sirajuddin and his sister Fairuz, are the key contributors. Last year, both of them did not take part. Once again, Selangor becomes the overall champion in the MSSM Chess Championship after collecting 120+ points. As far as GiLoCatur concern, it is a hattrick since 2009. It is not based on the most gold medals won to decide the overall champion. And it is also not really based on the number of medals. It is based on a point system. The final sixth round will be played this morning at 8.30am. 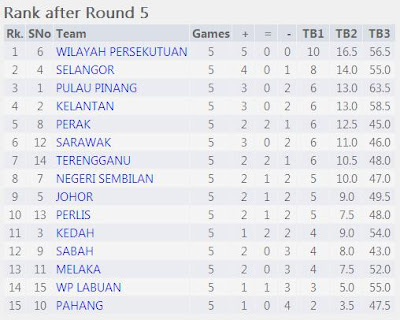 In the P15 Team category, it looks like Wilayah Persekutuan will become the champion like its L15 counter part. Its opponent is Sarawak on the top table. And it looks like Selangor will get the silver medal provided that the team wins over its opponent, Terengganu. SELANGOR MUST WIN! The chance is very slim for Selangor to overtake WP to become the champion. But, hey the fight is not over yet until the final round has completed. So, what's your prediction? 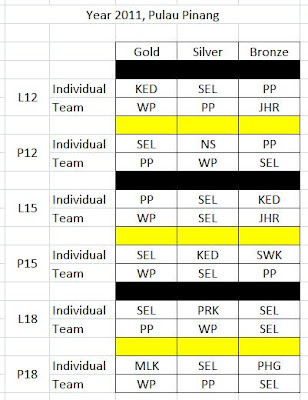 Gold - WP / KL?, Silver - Selangor?, Bronze - Pulau Pinang? Johor? Perak? Kelantan? The L15 category completed yesterday evening after the final sixth round was played at 3.15pm. So, the results of such category is known earlier than the rest categories. Elgin Lee drew his final game with Kedahan player, Iskandar Danial. Both Roshan of Selangor and Shreyes of Pahang won their respective games. In this edition, Pulau Pinang could not defend its gold in L15 team category. Instead, it wins gold medal for L15 Individual category through Elgin who played in the team event last year. Once again, Roshan won the silver medal while Iskandar Danial who represented Kedah won the bronze medal. The Selangor L15 team comprises of Fikri Saleh, Muhammad Irfan Haqqim Azhar, Low Jun Keat and Sunil Kalivanan, was really heartbroken yesterday afternoon in the final round. It was leading by 2 match points getting into the final sixth round at 3.15pm. The teams needs only a draw to claim the gold medal. But it did not end that way. The Johor team dashed the dream and hope of the Selangor team to be the champion.The former defeated the latter with 3 - 1 score. 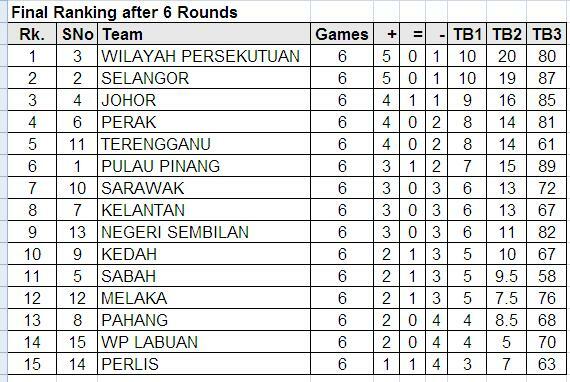 With that result, both Selangor and Wilayah Persekutuan (WP) have same 10 match points from 5 wins. 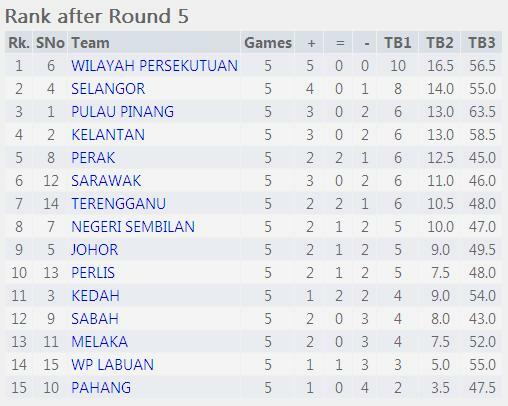 WP or KL became champion since its second tie break (game points if GiLoCatur is not mistaken) is higher by one point. The win over Selangor helped Johor to claim the bronze medal after scoring 9 match points from 4 wins, 1 draw and 1 defeat. Such win also had made the WP / KL team happy and victorious. GiLoCatur's advice to the Selangor L15 team, FORGET ABOUT THE DEFEAT, MOVE ON, LEARN THE MOST VALUABLE LESSON AND COMEBACK STRONGER NEXT YEAR. BE PROUD OF ACHIEVING THE SILVER MEDAL. Syabas and tahniah from GiLoCatur to the WP L15 team. GiLoCatur started to be part of MSSM Chess Championship in 2009. In that year, GiLoCatur's daughter, Anis Fariha, represented the state for the first time. Even though, her brother Fikri played in the state chess tournament one year earlier, it is really her luck to become a Selangor state chess player earlier and got a Gold medal in P12 team category in her debut. Luckily, GiLoCatur's first time MSSM was in Klang, Selangor. In last edition, Fikri joined his sister to be part of the Selangor chess contingent in Kangar, Perlis. Fikri played in the L15 Individual category with Roshan. He was placed ninth. 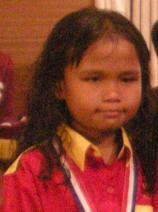 Meanwhile, Anis got the Silver medal in the same previous year category. Her team mates were the Puteri siblings and Sun Xin. In this year edition, she moved up to the P15 team event along with Sun Xin. Let's take a look at the Selangor state chess team. 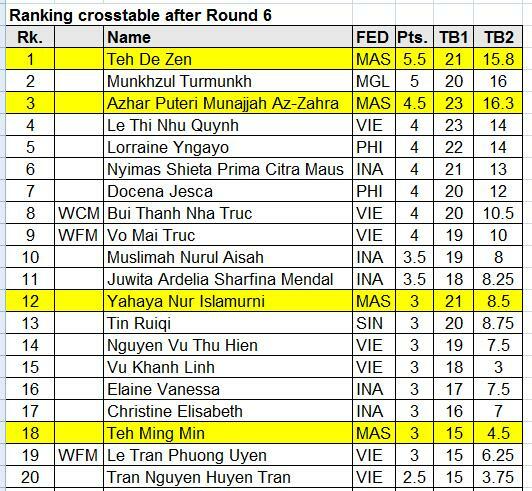 After Round 3, Zhi Chen is fourth with 2.5/3 score out of the total 30 players while Azam is tenth after scoring 2/3 points. GiLoCatur strongly believes that the two of them can make it to the top five. The team is seeded fourth based on last year final placing. In the first round, the team defeated Terengganu with 2.5 - 1.5 score. Then, they were victorious by winning all boards against Labuan. In the third round, the team lose to Pulau Pinang by 1 - 3 score. Daryl so far maintains his perfect 3 out of 3 winning. In the fourth round, the team will meet Kuala Lumpur. GiLoCatur hopes the team to better the fourth position. After Round 3, both Najiha and Rifqah scored the perfect 3/3 points. They will play against each other in the fourth round. Joining them in the lead is De Zen from Pulau Pinang. Selangor has a very good chance to win the Gold medal in this category. The team is seeded second based on last year final placing. In the first round, the team defeated Sarawak with 3.5 - 0.5 score. Then, they were victorious by winning all boards against Labuan. In the third round, the team lose to Johor by 1.5 - 2.5 score. In the fourth round, the team will meet Perak. 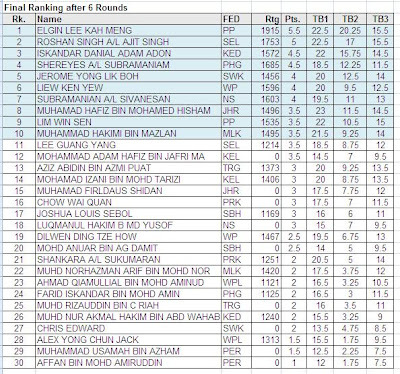 After Round 4, Roshan is ranked fourth after scoring 3/4 points while Guang Yang 18th with 2/4 points. Roshan fought very hard in the fourth round against Elgin Lee of Penang. GiLoCatur strongly believes that Roshan can make it to the top three, but he needs to comeback from the defeat. The team is seeded second based on last year final placing. In the first round, the team defeated Kedah with 4 - 0 score. Then, they were victorious by scoring 4 - 0 against Kelantan. In the third round, the team edged their toughest challenger Kuala Lumpur by 3 - 1 score. In the fourth round, Fikri and his team mates managed to win over Pulau Pinang with 2.5 - 1.5 score. Fikri so far maintains his perfect 4 out of 4 wins. In the fifth round, the team will play against Perak. The Selangor L15 team is on the right track to win the Gold medal. 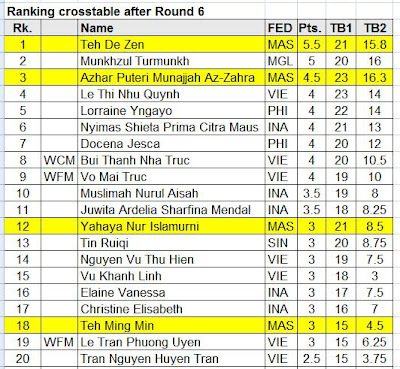 After Round 3, Xin Yen is leading the pack by scoring the perfect 3/3 points while Nabila is 5th after scoring 2.5/3 points. In the fourth round, Xin Yen will play against Hoh Tjin Hui who drew with Nabila in the previous round. Meanwhile Nabila will play against Siti Aisyah Sabirin from Terengganu. Selangor has a very good chance to win the Gold medal in this category. The team is seeded fourth based on last year final placing. In the first round, the team convincingly defeated Melaka with 4 - 0 score. Then, the team edged Labuan 3 - 1. In the third round, the team won over Kelantan with 2.5 - 1.5 score. 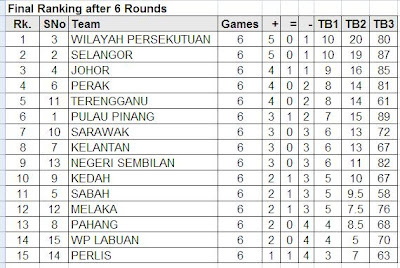 After Round 3, Selangor and Kuala Lumpur scored the perfect 6 match points. In the fourth round, both team will face each other. GiLoCatur strongly feels that which ever team wins, it will become the champion and won the Gold medal. 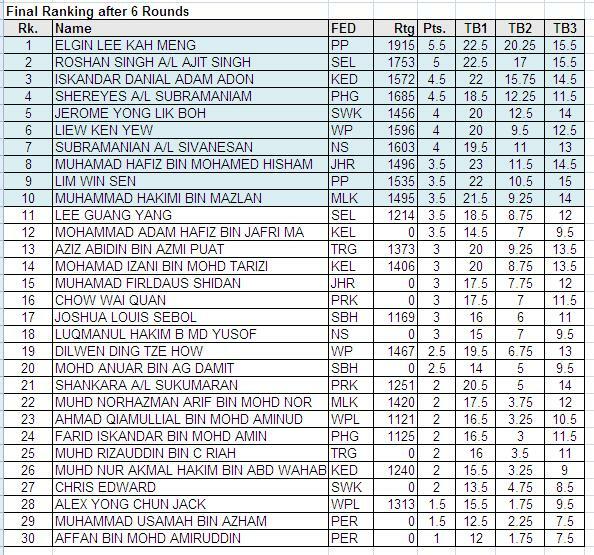 After Round 4, Nabil is leading the pack after winning all his four rounds while Syakir is fourth after scoring 3/4 points. GiLoCatur strongly believes that the two of them can make it to the top three where Nabil has a very strong chance to emerge as the champion. The team is seeded fourth based on last year final placing. In the first round, the team defeated Negero Sembilan with 4 - 0 score. Then, the team beats Melaka 3.5 to 0.5. In the third round, the team defeated Perak, the defending champion, 4 - 0. In the fourth round, the team managed to draw with Pulau Pinang who earlier had beaten the tough Kuala Lumpur team. In the fifth round, the Selangor team will play against Johor. After Round 4, Amira is ranked second after a perfect 4/4 score while Dhanusya is ranked fourth after scoring 3/4 points. Amira will play black against Alia from Melaka while Dhanusya will play white against Sarika of Pahang. The team is seeded third based on last year final placing. In the first round, the team defeated Pahang with 3.5 - 0.5 score. Then, the team beat Labuan 4 - 0. In the third round, the team drew with KL. In the fourth round, the team lose to Pulau Pinang 1.5 to 2.5 score. In the fifth round, the team will play Sarawak. ALL THE BEST TO THE SELANGOR CHESS CONTINGENT! BE THE CHAMP AGAIN! GiLoCatur is at the sixth floor of Tanjung Bungah Hotel waiting for Fikri to play the fourth round. In the afternoon session today, all the other five categories take a rest. Only the L15 category is playing. The category will complete its six rounds tomorrow while the other five will complete their six rounds on Saturday. Top board battle between Pulau Pinang (Elgin) and Selangor (Roshan). For anyone who wants to know the latest results and the pairing for other categories, click below links. TERIMA KASIH to Nestle who sponsors Milo drinks to all the chess athletes and officials including accompanying parents. GiLoCatur took the opportunity too to sip three cups of the free Milo. "TQ, abang Milo"
Hopefully, more sponsors especially for CHESS! The top seed is the Penang team after being the champion last year. Selangor which includes GiLoCatur's son, Fikri, is the second seed. Last year, Fikri played in the individual category. This year he plays in the team category. His other team mates are Irfan Haqqim, and his two district team mates Jun Keat and Sunil. Two rounds had completed and the third one will start at 3 o'clock, in about half and hour. Below is the first round result and pairing. All the top four seeds as well as Perak, the sixth seed, cruised through the second round with convincing full match and game points. William Lee Kah Howe led his team to win over Pahang. Fikri who won against Ooi Xi Sheng helped his team to win 4 - 0 over Kedah. Meanwhile, both Wilayah Persekutuan and Johor defeated their respective opponent teams. In the second round, the top four seeds continue their winning streak, also with full game points. In the third round, the four teams meet each other. Pulau Pinang plays Johor and Selangor plays Kuala Lumpur. This round is very important to all the four states to decide who will emerge as the champion. LET'S THE BATTLE BEGIN! MSSM Chess Championship is in its second day. Two rounds of standard format (90 minutes per player) out of the total six had been played up to now. The next third round will start at 3 o'clock this afternoon. Click here to view the tournament schedule. 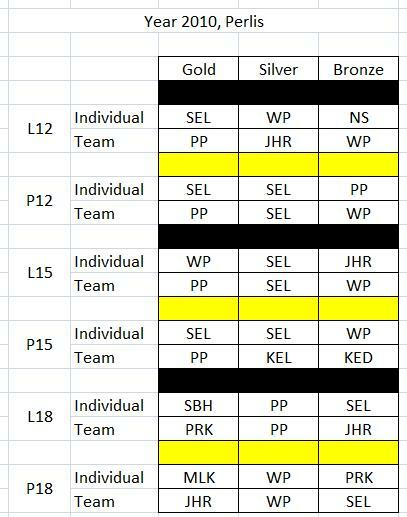 Each of the six categories - P12 (girls under 12), L12 (boys under 12), P15 (girls under 15), L15 (boys under 15), P18 (girls under 18) and L18 (boys under 18), will have a rest round alternately. The starting rank list for all the six individual categories has been published in the CATUR MSS 2011 blog site.